Then The Search for the Giant Squid showed up in my local library. I was an active reader at the local Greeneville Greene-County library at the time. Almost every time I would go in, I would spend ages and ages at the scientific books, especially the marine biology books. I wanted to do ocean work then, so I’d tank up on anything that spoke about the ocean, regardless of how much bigger or for what audience it was meant for. I was elated when I came in one day and saw The Giant Squid on the bookshelf, immediately borrowing it. My 15 year old self toted it back home and I read it for weeks on end. I soaked up facts about the giant squid, its cousins, everything. Even the stories about fishermen seeing squid as long as their boat. If fueled my imagination as I stayed up late at night reading passages over and over again to drill the facts in my head. I had the books for a total of six weeks, and had to return it after using up both my renewals. But I had made lots of notes, and knew a whole lot about the giant squid that I ever did. For instance, I was aware that a giant squid was red when it was alive. All the white ones I kept seeing online were preserved specimens. I also found out that Architeuthis wasn’t the biggest boy on the block, the colossal squid supposedly outdid his lengthy cousin in mass. It also theorized that a sperm whale could emit a burst of high-end energy ultrasound like a sonic cannon, firing it at squid to disable it. Lots of stuff. Now and then I’d borrow the book again, but as I gravitated towards Astronomy, I finally had quit borrowing the book. One day I had picked it up and scanned through an updated version back in 2008, but left it out of mind till about 2013. The Search for the Giant Squid was one of the books I bought en-masse of November 2013. Already the world had been shocked by the pictures and then video of the giant squid that had been discovered off the coast of Japan. I realized that the book I had was now an outdated relic; mostly historical accounts about the squid back in the 90’s. You wanted a book review, you say? Long story short. Great book. Wonderfully done, proper citing, nice pictures. Updated paperback version is a nice change from the old hardcover edition. Richard Ellis is the penwriter behind it, and does a darn good job at it, too. Having written a host of other books among various creatures and ocean life, he’s also a painter to boot as well. To top it all off, the dude even works at the Museum of Natural History up in Manhattan, which I visited in 2010 (didn’t know then, sadly). Content is fairly thorough; we start with basics such as is the giant squid a monster? What do we call it? What do we know about it? How does it affect us in culture? What about its adversary the sperm whale? (Yes, there’s an entire chapter devoted to that). However, with all that wonderful writing, this book is now a bit dated. The thing we’ve discovered about the giant squid in the last five years rivals if not overshadows what’s in that book. 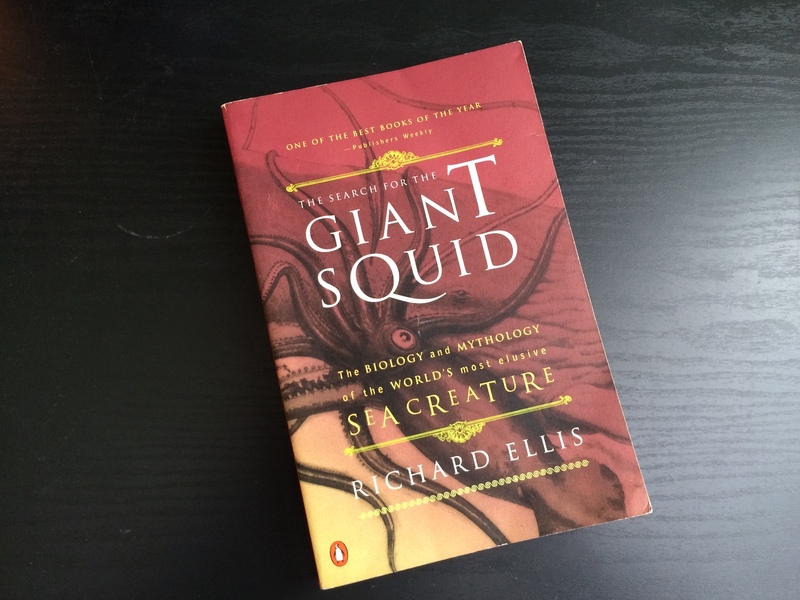 A good chunk of the book goes on about size, how big the squid may grow, their offspring, etc. We know some of this know. The simple fact that we have digital HD footage of a giant squid speaks volumes of what we’ve accomplished. The age of the Internet is now much more prevalent; a lot more giant squid information is readily available to read on. The book however has one good redeeming quality; it is a solid reputable source of information. If you’re getting tired of hearsay on the Internet with clickbait articles, pick up a copy of this book. It’s cited and researched, so you have accurate dependable information to go on. It’s a stark reminder of how progress has progressed, and how times have changed. I’ve seen change as a living person of this squid’s discovery unfold in my lifetime. I somehow knew that they’d find the giant squid when I was an adult, but the question was when. That gives you the feeling of how time has passed. Richard Ellis himself even got to review the footage of when the giant squid was filmed in 2012 and was one of the first people to react to it. I always keep hoping that he’d amend his book and make an updated version, but I don’t think that’s going to happen. As most of his books have eBook versions, this is one of the few that aren’t. I believe that should speak for itself of its future. Sure, we now disprove that the giant squid probably doesn’t grow more than fifteen feet long without its feeding tentacles. But who knows? Maybe a 100-foot giant is out there. I certainly like to think so.